The Tarkhan Dress isn’t really a dress. It’s a linen chemise nowadays, although when it was new it may have been longer. The hem is gone so there’s no way of knowing. The garment was discovered during Sir William Matthew Flinders Petrie’s 1913 excavation of a 1st Dynasty tomb in a 5,000-year-old cemetery at Tarkhan, Egypt, 30 miles south of Cairo, only neither Flinders Petrie nor anybody else realized they had found it. Sixty-four years would pass before somebody did. The mud-brick niched tomb had been extensively looted in antiquity. There was little left inside besides a set of alabaster jars, two wooden tool handles and pottery (which is why they dated the tomb to around 2,800 B.C. ), and what Flinders Petrie described as a “great pile of linen cloth.” The pile of dirty linen went to University College London whose modest collection of Egyptian artifacts would expand by orders of magnitude when they bought Flinders Petrie’s enormous collection in 1913. The university museum is now the Petrie Museum of Egyptian Archaeology. In 1977, the pile of “funerary rags” was sent to the Victoria and Albert Museum’s Textile Conservation Workshop for cleaning and conservation. The conservators discovered the Tarkhan Dress buried between 17 different kinds of textiles. At first they thought it was just another rag, but when they followed one seam they found another rag stitched to it, and then another. That’s when they realized those three rags were in fact a tunic with two sleeves. It was inside out and showed signs of wear, namely creases at the elbows and armpits. The v-neck linen shirt with tiny pleats on the bodice and sleeves was in excellent condition, considering its age. Conservators stitched it onto Crepeline silk so it could be placed on a dress form and displayed the way it was worn thousands of years ago. 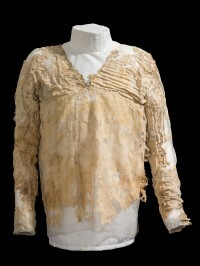 Because of the age of the tomb in which it was discovered, the garment was hailed as Egypt’s oldest garment and the oldest woven garment in the world, but because the tomb was not intact and the linens from the burial chamber had been jumbled and dumped by looters, its context couldn’t provide a reliable date. Radiocarbon dating the garment was out of the question in 1977 because back then the test required a sample the size of a handkerchief. Some of the linen in the pile was analyzed in the early 1980s by the then-new technology of accelerator mass spectrometry carbon dating which dated it to the late third-millennium B.C., but the results were too broad to satisfy and the samples weren’t taken from the dress itself. Last year, a tiny 2.24 milligram sample of fabric was taken from the Tarkhan Dress and radiocarbon dated at the University of Oxford. The testing found there was a 95% probability that the garment was made between 3,482 and 3,102 B.C. Modern AMS dating is usually more precise than that, but the tininess of the sample made a wider range necessary. As the 1st Dynasty is thought to have begun around 3,100 B.C., there’s a good chance the Tarkhan Dress pre-dates the Early Dynastic period and the first pharaohs to rule over a unified Egypt. For all you sewers out there, the Petrie Museum has patterns and instructions on how to create your own Tarkhan Dress. It assumes a basic grasp of skills (like how to pleat) and terminology (what is this whip stitch you speak of?) so it’s not for beginners. Should you take the plunge, I am in a position to guarantee you one glowing blog review and probably at least a good dozen comments. This entry was posted on Friday, February 19th, 2016 at 11:53 PM	and is filed under Ancient. You can follow any responses to this entry through the RSS 2.0 feed. You can skip to the end and leave a response. Pinging is currently not allowed. You are absolutely right. The sample size was 2.24 milligrams, or 0.00008 ounces. I must have been hallucinating when I moved that decimal. Thank you kindly for catching it. A Truly fascinating post thank you. Thank you for the correction. I’m relieved it wasn’t eight ounces! I know, really. The whole dress probably weighs less than 8 oz! Ohh, yes I see that now. I actually know how to do a whip stitch! My mom taught me how to sew a button and hem pants on the general principle of teaching your kids not to be utterly helpless idiots. That’s where my abilities end, but it’s certainly come in handy many, many times. “For all you sewers out there” made me pause. I guess my mind was in the gutter. Now that’s a quality pun. Well played, sir! It was found inside out in a pile of rags? 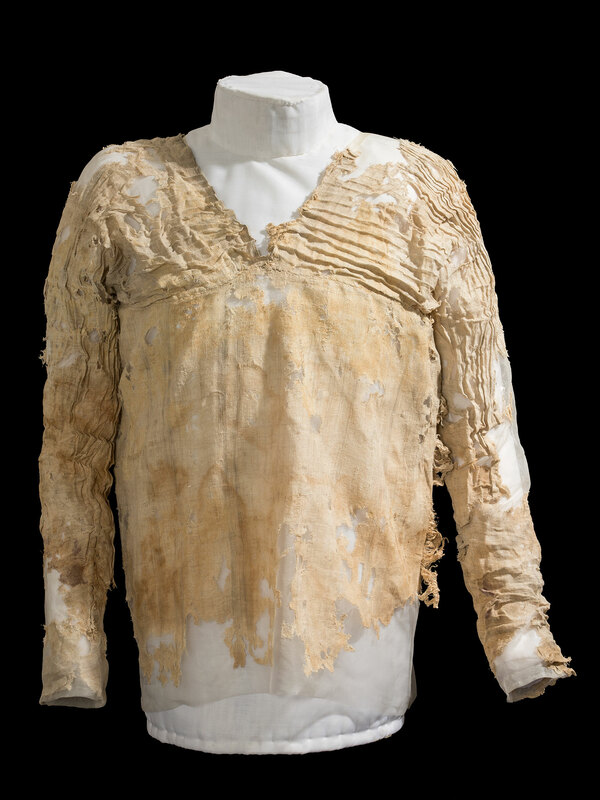 Maybe one of the looters wore it into the tomb, found a fancier garment belonging to the tomb’s occupant, whipped off his shirt/robe/dress and left it to be found thousands of years later? It’s possible, but the pleats were very fancy for the time. There are slightly younger tunics and gowns that were found in clean contexts that have no such embellishments. Good catch on the funky pleating! I wonder if the maker goofed up. Goodness knows I’ve stitched on many a sleeve inside-out or backwards But it’s also possible that this was totally in style at the time. I think it has to have been deliberate. It look so cool, too. Project Runway designers, take note. The orientation of the pleating does look deliberate, doesn’t it? I can’t imagine someone making a mistake of that sort, especially sewing by hand. I also would love to get a closer look at the weaving- It may just be the age, lighting, and the crumpling of the fabric, but the bodice, at least, may have been woven with a subtle square or striped pattern created by warping with a slightly larger thread on repeats, and weaving with weft in the same repeat. I so want to get up very very very close…. Oh, wait, I see that the instructions state that two threads are together in “places” to make a striped fabric (though I think I see doubled threads horizontally too. Clearly the stripes/checks are also deliberate design elements. So yummy. Man, you know things and stuff. Make it! Hi all, just another aspect to this post. Sir William Matthew Flinders Petrie, was in fact, the grandson of another famous and eminent discoverer. Matthew Flinders was our most famous navigator (second only to Capt James Cook) and cartiographer of that rather large antipodean continent, as well as the namer of it. No longer New South Wales, New Holland or just Terra Australis but Australia. On his last trip back to England he was detained and held for six years on a small French Island. It was during the time of the Napoleanic Wars, he did though find time to complete all his writings there and thankfully arrived back in time before he died to father a daughter – William’s mother Anne. Matthew Flinders is remembered in the naming of many towns and geographic features around Australia including Flinders, Victoria, The Flinders Ranges as well as the Flinders University in South Australia, as well as probably a hundred others. Even his cat was famous – Trim. You may have even mentioned this cat previously. So Anne married a Mr. Petrie and conjoined their surnames, I presume? How very cool. Fascinating history, thank you for writing about it. I don’t think I’ve mentioned Trim before, but I will go out of my way to do so now. It’s wonderful that it’s still extant. Looks like you could blow it apart with one gentle breath. It’s a gossamer thing, isn’t it? Probably being nestled in a pile was the best thing that could have happened to it. Which is why some sewing enthusiasts have come up with the agonizing term “sewist.” Knitting = knitter, so sewing = sewer. I’d rather live with the crazy regular old English language. Sewist just doesn’t sound right. Sewer only looks like a homonym. Spoken it’s fine. Sorry, that was meant as a reply to Dean Booth above! Unfortunately I am apparently not a good commenter OR commentist. You are both! Alas, the comments refusing to nest properly is a bug of the very old theme. I can only get mine to nest if I reply from the admin control panel. I am also intrigued by the pleats and especially by how they were fixed in place like that. I definitely think the directions of the pleating are intentional because pleating takes time and care and must have been an expensive decoration at the time (based on all the pleated linen in Egyptian art). I see the pattern description is talking about setting them using water and a bit of heat though (on a normal fabric, you set pleats by pressing them with hot steam). I wonder how well that would work but I really doubt I could get my hands on the right fabric and it seems like the effect would rather depend on that… The vast majority of modern fabrics has been treated, either with chemicals or just with things like heat and water, to make the fibers more even and to give the materials the properties customers want. For linen, that often means making it less wrinkly. The fabric needed to try and replicate a Tarkhan dress would have to be super-fine, completely untreated linen.